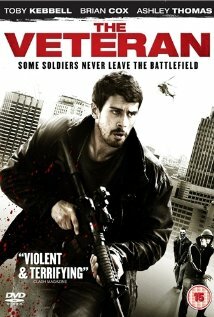 The British movie The Veteran is asking a few interesting questions but the story as such isn’t very convincing. Too bad. It had potential. What happens with all those young veterans coming home from wars like Afghanistan or Iraq? Their tours are finished and when they return they have to face the bitter truth that it will be hard for them to find a job and that people really don’t care about them. Rob is just a guy like that. When he returns from Afghanistan all he finds is an ugly apartment in one of the areas of London were the less privileged live. Drug wars and gang feuds are common. Unemployment is high. One of his comrades approaches him and tells him his brother offers them a job. The job they are offered is pretty typical for veterans. Surveillance. They are told they have to follow potential terrorists and find out if one of the informants they are using is really trustworthy. Rob gets beaten up pretty bad during some of his missions and after a while it dawns on him that something is dodgy. Too late. I’m not going to reveal more of the plot as it’s pretty thin. The movie is still watchable as it depicts a lot of the problems the UK are facing. Not only regarding their veterans but also regarding the many young and unemployed people. It’s an interesting companion movie to Harry Brown and also to the US series Homeland. The acting is pretty good but the story a bit too thin. And the message? I have no clue. That’s probably what bothered me the most. Before I end this post I just want to let know that I will not be online during the next two weeks. I’m travelling. This entry was posted in Movie, Reviews, Trailer, War Movie and tagged Movie, The Veteran, UK Movie, Veterans, War Movie. It gets a 60% rating on Rotten Tomatoes so most critics liked it. There were a few movies like this (PTSD vet continues his war back home) after the first wave of Vietnam War movies. Most (all?) were trash like Gordon’s War and Dead Presidents. This sounds better. It is on Netflix Instant so I may get to watch it in the near future. Will I like it? I’m back from my trip. Hmmm, would you like it. I’m not sure. The message is a bit weird. I really didn’t understand what they wanted to say. It was interesting to see how dorky he was on his missions. I just watched it and it is entertaining, but certainly not a war movie. I especially give credit for the unconventional ending. Very powerful. The biggest problem was the gymnastics necessary to create a justification for him to go after two sets of bad guys. Not in the strict sense of the word, no but entertaining, yes. A bit weird too, I’m not sure what the political agenda was. I liked that he failed so often and the ending is just another aspect of it, makes t believable. Not just a hero tale. I feel pity for all those veterans who return and nobody cares what they become. This movie was OK, but its a bit of a weird fish. Its not really a ‘war movie’ and apart from the main character being the titled ‘Veteran’ its more of a vigilante gang type movie with a kind of half arsed side story….well…thats being unfair to actual half arsed side stories…more like 2 1/4 arsed side stories mashed into one rambling narrative. But you can enjoy it for what it is. Some bloke gunning down waves of Chavs…thats the correct pommy lingo I believe, if your an Aussie swap the word out for Bogans. So I say its a bit of a misnomer, doesn’t really deal with real issues affecting returning veterans from modern conflicts and is more an homage to those disgruntled ticking time bomb Vietnam Vet vigilante movies of the 70’s and 80’s. I’m glad you found it to be a bit weird as well. Not totally bad but i didn’t really know what to make of it. There’s a bit of a wave of similar British movies right now. Harry Brown- ok, it’s 2009, still, in that vein, and then the one with Sean Bean Soldiers of Fortune which I couldn’t really watch and I’d also say Ken Loach’s Route Irish is in this categor. There were a few others…I’ll have to think. I have no clue which movie that is.